Joey Crouch is a straight-A student who lives with his mom in Chicago when she is suddenly and horribly killed by a bus. Child Services locates his father; Joey‘s mom has never told Joey anything about him. Imagine arriving in Bloughton, Iowa; your father is nowhere for 3 days; there is no food in the hovel he lives in and it is filthy and filled with old newspapers. Joey gets himself to school and finds students hate him because his father is a garbage man. Joey’s horror story begins and we follow, unable to turn away when we learn his father is a grave robber, that there is a long line of insurrectionists; and one particularly crazy one, Boggs will stop at nothing to destroy Joey and his dad. Along the way you will learn the history of grave robbers, the methods of burials and lots about rats, maggots, death, and decomposition. Joey is so miserable in school with bullying he begins to join his father and learn his trade. You can’t turn away as you follow along with Joey Crouch and meet many unforgettable characters ! 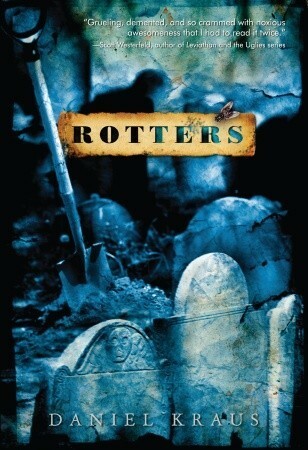 Sign into Goodreads to see if any of your friends have read Rotters.